Have you ever been tired at work? Of course you have…who hasn’t? Usually, it’s something a little caffeine can fix. However, workplace fatigue may lead to more serious issues. The National Safety Council found that fatigue can lead to productivity losses of almost $2,000 per worker each year. It also increases the likelihood for workplace accidents. Fatigue can be caused by a number of factors, such as being overworked with little or no time to rest or sleep. That leads to slower reaction time, more errors, and decreased cognitive abilities. Studies have focused in on the effects this can have on shift workers, health care workers and drivers. Those positions run the highest risk of fatigue, as people work long hours many days in a row. They may also be exposed to harsh environmental conditions, such as working in the rain or snow. Data from the National Health Interview shows that the normal U.S. injury rate incidence is 2.27 per 100 workers who sleep between seven and eight hours. For workers who sleep less than five hours a day, the incident rate is 7.89 per 100 workers. It’s easy to get caught up in the 24-hour society… the mentality that everyone needs to give 100 percent all the time. But taking a step back and prioritizing wellness in the workplace can prevent injuries and even death. While workers can take steps to prevent fatigue by adopting better sleep habits, employers can also help with the issue. Supervisors should be trained to be aware of signs of excessive fatigue among workers. This can include yawning, head dropping, and difficulty remembering or concentrating. However, new technology has become popular in monitoring employee fatigue. Recent: Can Technology Help Workers Recognize Mine Hazards? A Chicago-based manufacturer installed sensors in its trucks to monitor operators after one driver fell asleep at the wheel. The sensor can track eye movement and sends alerts through vibration or loud alerts when the driver is falling asleep or distracted. 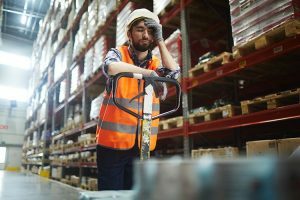 A workplace fatigue risk-management program should include training, auditing, and reporting of fatigue-related incidents. Encourage employees to take breaks, provide coffee stations, and keep an eye on environmental factors. Installing brighter lighting and keeping a cool temperature, especially at night, can make a huge difference. Don’t let your employees run on empty; combat workplace fatigue. Prioritize health and wellness with medical surveillance.